Come join us for an introduction to neutron theory and techniques! 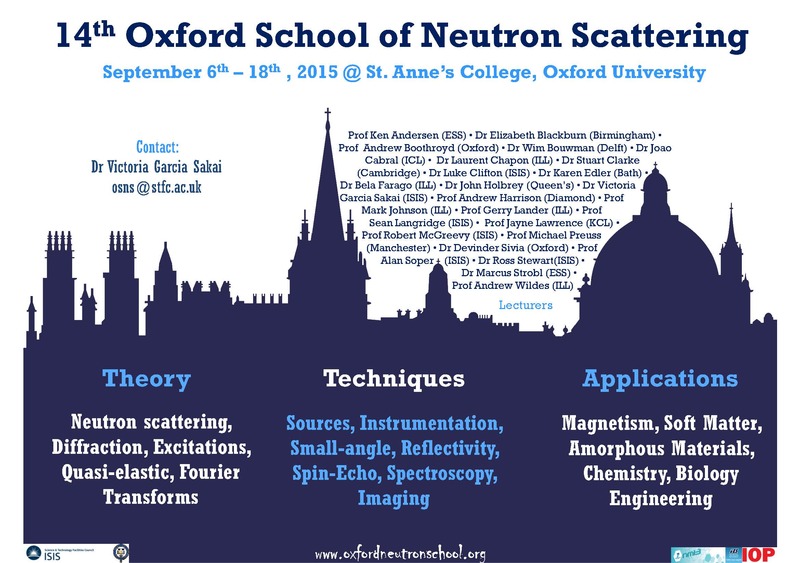 Programme: The first week of the school introduces students to the core concepts of the theory of neutron scattering, neutron sources and instrumentation, and neutron diffraction. By the end of the first week, the school moves to more specialised neutron scattering techniques and applications to scientific fields of interest. Among the techniques covered are: inelastic scattering, imaging techniques, small-angle scattering, reflectometry, neutron-spin-echo and quasi-elastic neutron scattering. In the final two days of the course, students can choose to follow three of the following six scientific subject areas; magnetism, soft matter, biology, engineering, chemical applications and amorphous materials. The students will also be asked to make short presentations to their peers about their current research projects and work in pairs to write a beamtime proposal. The students will also have the opportunity to visit the ISIS pulsed neutron and muon facility in Didcot. Application: To apply for the school you will need to submit a personal statement and a statement from your academic supervisor that will be used in the selection process. Applications should arrive no later than the 1st May 2015. The course is normally highly oversubscribed, so we encourage applicants to apply in plenty of time, as late applications will not be accepted. Students are selected for the course, based on their requirements for neutron scattering techniques as part of their present and future research activities. Students will be notified shortly after of the outcome of their application. The school is open to all applicants worldwide. Fees: School fees for 2015 are £420 (~ €560) per residential student which includes the cost of a bedroom during the school, breakfast and evening meals, teaching materials, drinks reception and the gala dinner. There are 50 residential places available. There are also 10 non-residential places for students who do not require local accommodation, at a school fee of £100 (~ €140), which includes teaching materials, drinks reception and gala dinner. Fees will be payable once the names of successful applicants have been announced. Organisers: Victoria Garcia Sakai, Ross Stewart, Luke Clifton and Sean Langridge (ISIS); Andrew Boothroyd (Oxford University).